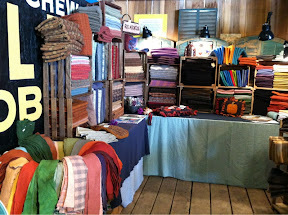 This is my booth in the barn ~ it looks almost the same as any other show but a little different. We added more lights and I think the barn lighting was better! 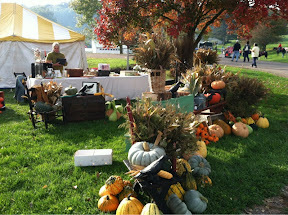 This is friend Sherry Davis ~ she is a master at gathering wonderful fall goodies and a master of display! Her daughter, Gretchen, is a master cookie baker, too!! Cute things under this little tent! A treat to me from me ~ a stitched piece done by Stacy Nash! Every year I look and admire but never buy ~ this year I gave in ~ her stitching is perfect and I love her designs! 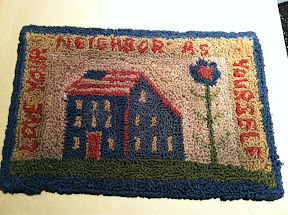 The artist of this small punch needle piece was right across from me ~ we traded wares ~ I got the best end of the deal! It will look perfect in the patriotic bedroom ~ needlework of any kind adds a softness to a room. It was a beautiful fall day in Ohio ~ a perfect day for a show! I don't have another one till mid November, so lots of time to regroup. I've had lots of interest in classes so this week, I'm going to make a plan ~ stay tuned!! At Malabar Farm ~ In the Spirit of Friends ~ link on my sidebar under Coming Events! We will be in the barn up by the Big House ~ stop and see us! I'm knee deep in wool! Just got a shipment today and getting it washed and dryed for tomorrow!! It's supposed to be a beautiful sunshiny day!! Nothing better than a fall show in beautiful weather!! Turned out great in spite of itself! We set up at 8 a.m. in the pouring down rain and it dwindled down to a drizzle that lasted most of the morning! We, who choose to do outside shows, are a hardy bunch for sure! We make the most of it and as luck would have it ~ around noon, the sun came out!! And so did the shoppers!! 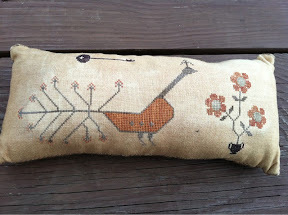 These pillows were for sale after I did the proddy edging at the show ~ I'll have them for Malabar in a couple of weeks! Sonny bought this great 'blue bottle tree' from one of the vendors! He had so many to choose from and since it has a blue glass gem hanging in the middle of the sunburst, it seem fitting for all the blue bottles that I've had stashed for just such a thing!! It's perfect in the garden and there are even a couple of extra blue bottles for the next tree! Sonny also picked up a bunch of sweet annie for me ~ my manfriend was on a roll!!! ﻿This is a bottle tree we saw at a winery on Put-in-Bay a couple of weeks ago. I meant to show this to you before but it fits right in with this post ~ a bottle tree that's all grown up!! We might need another one somewhere else in the garden because there are more 'bottles in waiting', so to speak!! Actually, at the end of the day, Saturday was quite fun! I saw my dear friend, Linda, who has had quite a year healthwise and I can tell, she's got her mojo back!!!!! A great smile, a great attitude and it made my day to see her in my booth!!!!!!!!! Lauren and Sheila and Joan and Susan and Jane stopped by and so many rug hookers that love wool! We're grateful for each and every one! And Terri stopped by ~ twice!!! On the way home, we stopped and had a great dinner at Skyway East with our friends, Vivian and Lou! We were all really tired but can always take nourishment ~ as I said ~ a great day! Yesterday, I attended a wedding shower for Sonny's niece ~ my sister-in-law, Pam, did such a great job decorating the tables and preparing the lunch! It was a fun afternoon! Today, I'm taking a breather and trying to re-group! The hooking room is calling ~ when I do a show, it's as if the room were turned upside down and is waiting to be turned right side up again! We're having a group here Friday afternoon, so I best keep on the move!! 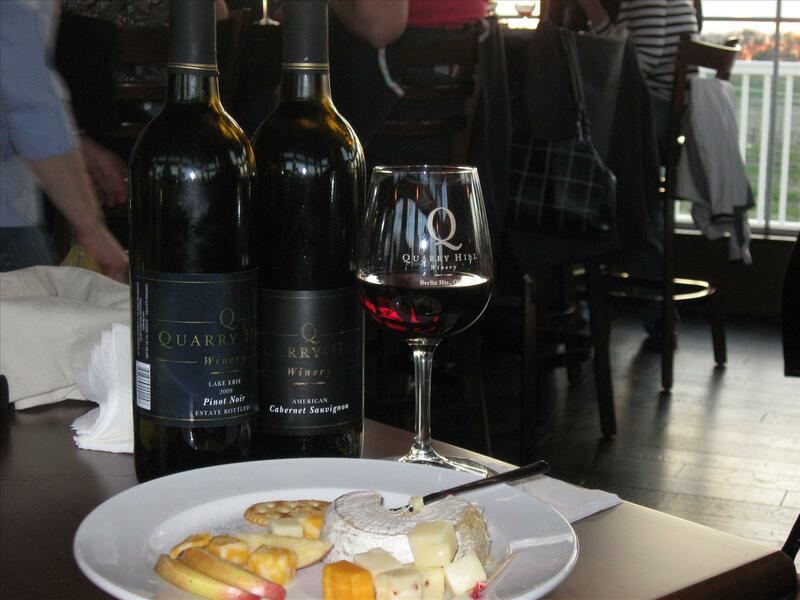 Thanks to all who came over to Quailcrest Saturday! We'll be at Malabar Farm the end of the month for the "In the Spirit of Friends" show ~ put it on your schedule!!! Last night, I burned the midnight oil hooking this humongous pumpkin! Drew the pattern right on the foundation cloth and tore 1" strips to hook with! It took me 3-4 hours ~ that's a lot of hooking, friends!! But I love it ~ going to bind it with wool and hopefully have it to sell tomorrow!! It is 14" x 16" ~ kind of a statement pumpkin!! I saw these on friend Lauren's blog ~ she inspired me to do this!! My plan is to draw some patterns and make up a couple of kits!! Sounds like a good idea, doesn't it? Yesterday, these came out of the dye pot ~ just gorgeous colors ~ love them all! If you love pastels, these are for you ~ luscious looking lovelies, I say!!! It's black as can be here and thundering at 4 in the afternoon! We're supposed to get a doozy of a storm and I hope it gets it out of it's system before tomorrow!! One year after Hurricane Fran, the tents blew away the night before our show at Quailcrest!! They moved us into the greenhouse the day of the show and then ~ the sun came out!!! Gave new meaning to the words "hot house". I thought I would melt into a puddle of fat!!!!! So, as much as I love to do this show, I'm looking forward to it with trepidation ~ it's always an adventure if you're anywhere near me!! I haven't packed my wool yet ~ guess I better go do that and things to finish of course!! Wish us luck!!!!! For Saturday's show at Quailcrest Farms!! These are rug punched ~ I like them a lot! Don't know if I'll finish them as a mat or as little pillows!! Time will tell ~ and I don't have very much time!! One thing I'm hoping to squeeze in is drawing a few of these pumpkin patterns to sell ~ I think I can, I think I can!!!!! 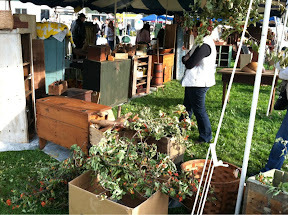 Years ago, a craft show friend gave me a box of things related to rugs that belonged to her mother! At the time, I didn't know what this was! Now, I do ~ just found it the other day!! It was 39 cents!!! Imagine! I'm going to try it one day when I have more than a minute to spare!! These bundles of roving are being readied to go into a basket ~ natural white and black along with some beautiful dyed colors! Deanne Fitzpatrick's patterns came in recently ~ love her things! I ordered smaller ones for quick little projects! And I'm really happy to have some of Maria Barton's (Star Rug Company) patterns to sell! There are a few Halloween but I love them all ~ she has such a distinctive design style! I met her mom and dad in a parking lot to pick them up ~ they live not too far from me so it worked out great! Thanks, Maria!! Back to the hooking room to get wool ready for marbleizing ~ sari ribbon to be put in small bundles ~ and pumpkins to hook! Woo hoo!!! Have a good day and THINK SUNSHINY SATURDAY for the show at Quailcrest! Check my sidebar under coming events for the link!! For the last two weeks ~ we've been having so much fun, there was no time to blog! Not entirely true ~ lots of work in between but here goes!! The week before last, we met friends at Quarry Hill Winery (picture from their website) on a Friday afternoon! So much fun on the veranda overlooking the vineyards laughing and carrying on, like only we can do! Saturday morning, bright and early, off to the antique show at Lakeside! A little smaller this year in terms of vendors and shoppers, but still lots of great stuff!! Lots of wicker everywhere ~ perfect for the porches on those Victorian houses and cottages that line the streets of this charming little place. Our one and only purchase was this folding metal chair! Isn't it the cutest? Very unusual and I thought a little hooked chair pad would look great on it!!!!! I also found an old 'cubby' that was a great price and would be perfect for wool ~ but we had the car and couldn't even begin to think of squeezing it in there! Too bad ~ I have dreams about it ~ wish I had bought it and figured out how to get it home later!!!!!! As soon, as we got back to the condo from there, we took off for our annual Put-in-Bay day with our lake friends!! There's a new place called The Keys and this is a replica of the marker in Key West at the Southernmost Point of the USA ~ this is the Northernmost Point ~ so close to our home away from home!! This cute parrot is the mascot for our cab driver, Dan The Man!! My friends say I took a picture of Stella last year when we rode in his cab! How quickly we forget!! Karen and I on the back of our friend's boat ~ he invited us for cocktails even though he wasn't there ~ so we made ourselves at home! This weekend we had breakfast at the new Tin Goose Diner at the airport outside Port Clinton. It's at the Liberty Aviation Center, which is also new and a pretty interesting place! The diner is an original brought from Jim Thorpe, Pennsylvania and is really nice inside. All stainless steel and red and white upholstered booths and seats ~ by the time, I thought to take a picture, it was full of people ~ which was a good thing!! Sunday, we had our annual Top Shelf Party ~ that's where we clean out the top shelf of our fridges and put it altogether for a little feast! Wine nobody else will drink, wine coolers, pickles, snacks, and maybe we each fix a little something special! It was fun ~ we sat outside in that heat and just gorged ourselves!! Four of our pals must have gone inside to get more goodies! ﻿We also got in some beach glass hunting but the pickings were slim ~ this is the results of a couple of different forays ~ kind of sad. The end of summer and it seems as though the beach glass harvest is winding down, too! 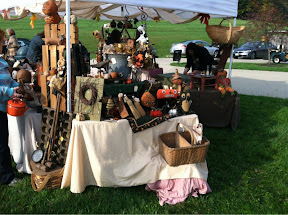 I'm getting ready for a show at Quailcrest Herb Farm this Saturday ~ there's a link on my sidebar under Coming Events. 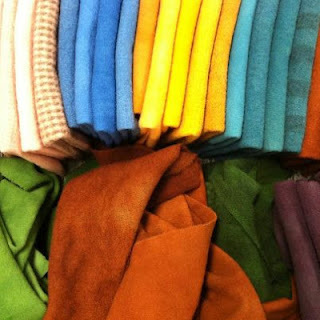 I'm marbelizing, dying, tearing wool, bundling sari ribbons and yarns ~ whew! Hope I'll be ready!!! I trust you all had a good Labor Day weekend and now we're ready to usher in Fall!!! There are still tons of Sauder rugs to show you ~ life is like a merry-go-round here ~ I can hardly keep up!! Talk to you soon!